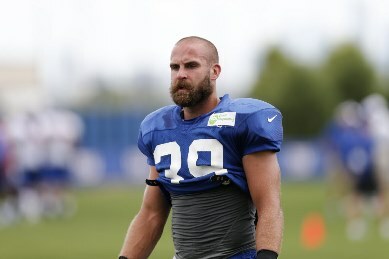 Tyler Sash, a former Iowa standout and NFL player, died in September. The autopsy showed the 27-year-old had signs of CTE - a “progressive degenerative disease of the brain found in people with a history of repetitive brain trauma, including symptomatic concussions ..."
CTE was a hot topic last year. It regained steam over the holidays with the release of the movie, “Concussion.” It keeps popping up even if the NFL would love if it went away. Many times after it pops up it fades away. But a story posted Tuesday by the New York Times … this one feels different. It’s not that any of these stories should fade as we return/retreat to watching football (again). But again, this one feels different. Last week, representatives from Boston University and the Concussion Legacy Foundation notified the Sash family that C.T.E. had been diagnosed in Tyler’s brain and that the disease, which can be confirmed only posthumously, had advanced to a stage rarely seen in someone his age. Dr. Ann McKee, chief of neuropathology at the V.A. Boston Healthcare System and a professor of neurology and pathology at the Boston University School of Medicine who conducted the examination, said Tuesday that the severity of the C.T.E. in Sash’s brain was about the same as the level found in the brain of the former N.F.L. star Junior Seau, who committed suicide in 2012 at age 43. Sash, a former all-Big Ten safety for Iowa who played on the Giants’ 2011 Super Bowl team, had been playing football for 16 years and had five known concussions — the last of which, with the Giants, effectively ended his career. The official cause of death was an accidental drug overdose — a mix of methadone and hydrocodone, the latter of which was prescribed to him to help deal with intense shoulder pain stemming from his playing days. You can reach your own conclusions about what killed Sash, but hopefully we can all agree that this is incredibly sad. It’s not less sad to hear these stories about men twice his age, but it is more jarring to hear them about a 27-year-old.